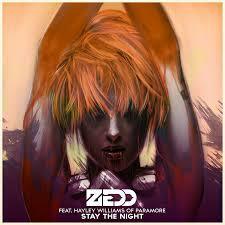 It seems like Zedd is going to be the latest hit machine because he released a new one called "Stay the Night" featuring Paramore's leader Hayley Williams. Just like "Clarity" and the monster it became, this tune has all the elements to become the same thing. While I do enjoy this latest cut, I hope Zedd does extend his sound further on next songs. Granted, he found a formula and it seems to be working, so why change that? Well, it will get old quick but I have hopes and for now I'm enjoying this. Stream below.